Do any other mums feel like every week there is some sort of fundraiser, event or bake sale at their children’s school? If so, and if you simply don’t have the time or the talent to help, then this note is for you. Every week I get a letter in my child’s homework folder. School bake sale . School fundraiser. Parent meeting. Gold coin donation. Walkathon. Colour run. Volunteers needed. As much as I love helping out when I can, the truth is, I work five days a week, I am hopeless at baking and my weekends are usually reserved for cleaning the house and watching Netflix, not barbecuing sausages or selling tickets for the school fete. One school in Texas understands. 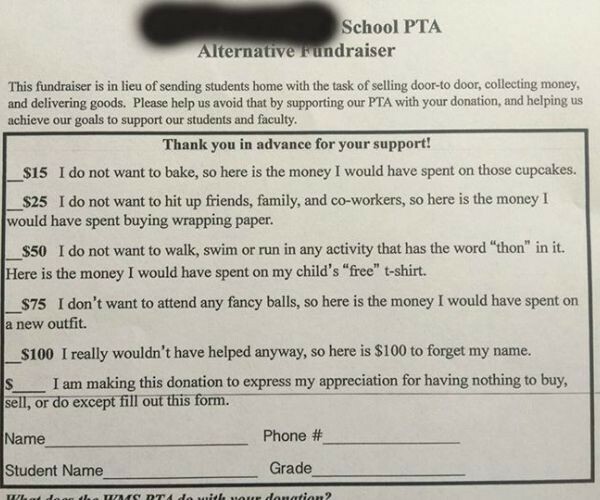 And thus, when they sent home this refreshingly honest and hilarious form for an “alternative fundraiser,” the letter instantly went viral over social media. The form gives time-poor parents the option of donating money outright, with perfectly accurate descriptions for each amount. Mum-of-three Dee Wise Heinz shared the letter that her daughter brought home from school on her Facebook page and it’s been a social media hit. “I think so many people have found this amusing because the large majority of us have had these thoughts ourselves at one point or another,” Dee tells the Huffington Post. The letter, which was designed for a bit of fun, clearly shows that all parents have the same struggles when it comes to school events. As much as I love them and am grateful to the school for putting them on, sometimes, I simply don’t want to bake. No one buys my burned cupcakes anyway.